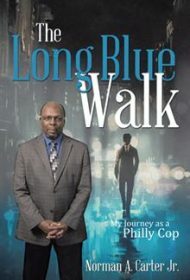 A veteran of more than 25 years on the Philadelphia police force, Norman Carter delivers an interesting memoir detailing the corruption he witnessed during his time as an officer. Carter became aware of such problems on his first assignment out of the police academy in 1967. A fellow officer told him that a speeding motorcyclist couldn’t be ticketed because of his organized crime connections. Carter learned quickly that police frequently ignored—or worse, worked in league with—lawbreakers. He vowed never to become one of them. “I had to make sure that throughout my career I would never be painted with the same scummy brush as those crooks with badges,” he writes. Carter makes it clear that the bad apples were relatively few, but they were protected by the decent cops who kept silent, part of an unwritten code. What he saw was unsettling at best, unconscionable at worst. Patrol car partners were selective as to which radio calls they would respond to; officers falsified crime statistics; he was asked if he “took a note”—jargon for accepting a bribe (when he said no, fellow officers gave him the silent treatment); officers expected free food and other considerations from merchants. Worse, some officers aided criminal enterprises, even participating in a burglary ring. When Carter blew the whistle, he was ignored, harassed, repeatedly investigated and reprimanded, and placed in dangerous situations on the street. Even after he retired, the hassles continued; to escape this, he eventually left his hometown and resettled in Georgia, where he has found a modicum of happiness. Even so, his message is clear and worth hearing, especially for anyone with an interest in law enforcement or the urban landscape of the 1960s, ’70s and ’80s.